1. Boil the sweet potato chunks for about 10 minutes, until tender; mash. Meanwhile, preheat the oven to its lowest setting and put a baking tray inside to warm. In a large bowl, mix together the part-cooked lentils, mashed sweet potato, caraway and 100g breadcrumbs; season, then shape into 12 patties. Tip the remaining 100g breadcrumbs onto a plate and dip the patties in them so they are evenly coated; chill until you’re ready to cook. Meanwhile, in a bowl, mix the red onion and lemon juice; set aside. In another bowl, mix the cucumber, mint and 1 tbsp oil; season and set aside. 2. In a frying pan, warm the remaining 3 tbsp olive oil over a medium heat. Add the patties and fry for about 4-5 minutes on each side, until golden and warm in the middle (you will need to do this in batches); put on the preheated tray in the oven to keep warm. Crack the eggs into the same pan and cook until the whites are opaque. 3. When ready to eat, combine the red onion and cucumber mixtures. 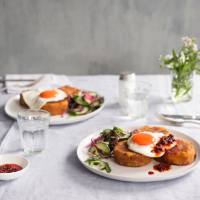 Divide the lentil cakes, cucumber salad and eggs between 4 plates, then top with the harissa just before serving.